Expanding our extremely popular Vizi Series of professional-caliber moving heads, ADJ is very excited to be able to introduce the new Vizi Wash Pro, our most powerful wash fixture to date. Offering a whole host of advanced features and effects as well as an incredibly potent and efficient LED-based light engine, this unique fixture is ideal for a wide variety of applications. 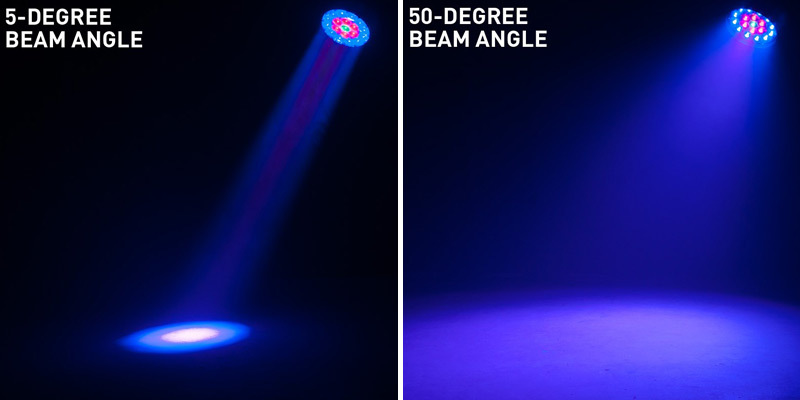 If you’re a lighting designer working on one-off events or touring productions, this easily portable fixture is ideal for generating rich washes as well as vivid beams of color. Equally, if you’re looking for a reliable and flexible workhorse for permanent installation in a large venue of any kind – be it a nightclub, music venue, church or theater – the Vizi Wash Pro has the output and feature set to meet even the most demanding of requirements. The Vizi Wash Pro has a 570W light-source, which is comprised of nineteen individual 30W 4-in-1 RGBW (Red, Green, Blue and White) Osram LEDs with an operational life of 50,000 hours. This generates an output of 28,000 LUX, measured full on, at 5M, with the tightest beam angle. The nineteen LEDs are arranged in three concentric rings, which can be controlled independently, allowing for the creation of eye-popping visual effects. 32 built-in color macros – including split-color effects – are provided to aid with quick programming. Full RGBW color mixing is also available – for each of the unit’s three LED zones – allowing for an almost limitless palette of colors and effects to be created. Smooth motorized zoom allows the fixture’s beam angle to be altered remotely from between 5 and 50-degrees. This means that the unit is capable of generating wide uniform washes of saturated color as well as tight punchy beams of light for mid-air effects in a haze-filled environment. It also offers variable speed strobing and pulse effects as well as 0-100% electronic dimming with a choice of six dimming curve modes. The fixture offers a wide pan and tilt range of 540-degrees and 270-degrees, respectively, and also offers pan and tilt inversion functions for when multiple fixtures are used but mounted in different orientations. It is also fitted with micro-stepper motors that allow 16-bit fine positioning and extremely smooth movement. A professional locking powerCON input socket ensures that the power supply to the fixture can’t be pulled out accidentally and auto-sensing variable voltage technology means that the unit is compatible with any input voltage of between 100 and 240V (50Hz/60Hz). This makes the Vizi Wash Pro suitable for international touring productions, as no power supply modification is required for compatibility with the supplies found in different countries around the world. The unit is fitted with both 3-pin and 5-pin XLR DMX input and output sockets, making it easy to integrate into any existing lighting system. It also offers a choice of three different DMX Channel Modes – 15, 19 or 36 – which means that you can choose the most appropriate option for any given situation based on the number of fixtures in use, the number of control channels available and the level of control complexity required. DMX addressing and selection of the unit’s various operating modes and options is facilitated through a large backlit display screen and four corresponding touch buttons. The fixture is also equipped with RDM (Remote Device Management) technology, which means that mode selection and DMX addressing can also be carried out remotely using a compatible control system. Measuring 13.25” x 17” x 21.25” / 335 x 430 x 541mm (LxWxH), the Vizi Wash Pro is relatively compact, especially considering the light output that it offers. It also has an easily manageable weight of 48.5 lbs. / 22 kg, making it ideal for use on tours as well as for the inventory of rental and production companies. A powerful and flexible fixture, the Vizi Wash Pro is a professional-grade moving head wash that offers incredible bang for buck. 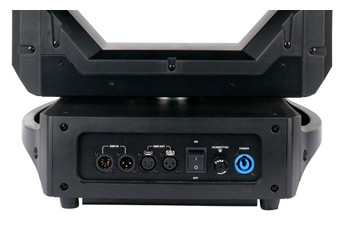 It has a feature set that allows for maximum creativity while generating an output suitable for use in large-scale productions and venue installations. 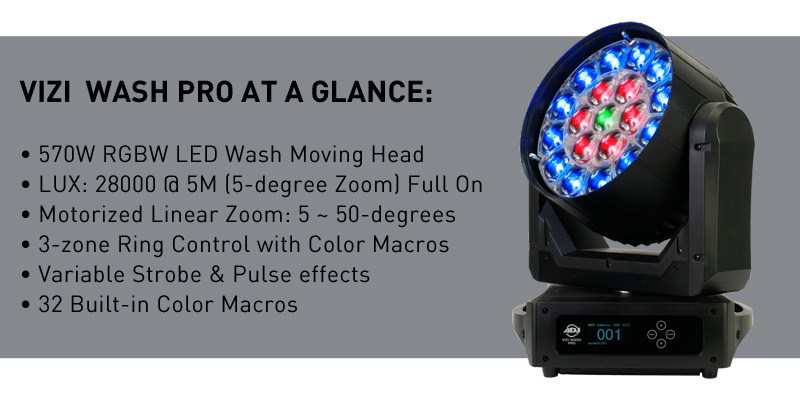 If you’ve been searching for a serious LED-powered moving head wash, this is sure to tick all of your boxes! The Vizi Wash Pro will be available June 2018.